Sponsored by Boeing. Conducted in association with IITB, IITD, IITK, IITKGP, IITM and AerotriX. Boeing - IIT National Aeromodelling Competition for college students in India is sponsored by Boeing, and conducted in collaboration with IIT Bombay, IIT Delhi, IIT Kanpur, IIT Kharagpur and IIT Madras. Logistics support for this event is provided by AerotriX. The competition is launched with the vision to provide a unified national platform for students interested in aerospace and related engineering disciplines - to demonstrate their aero-modeling expertise. Zonal Level: The Zonals would be held in conjunction with the Technical Festivals of IIT Bombay, IIT Kanpur, IIT Kharagpur and IIT Madras. The First three teams from each of the Zonal competitions, a total of 12 teams from the Zonal competitions, will participate in the National level. National Level: The National Level Competition will be held at IIT Delhi for all the toppers from the Zonal Round to decide the champion. Merit Award recipients will receive additional Merit Certificates. Evaluation will be carried out in two rounds for the Zonals; a qualifier round and a maneuver round. The evaluation criteria and the constraints are listed in the Problem statement. Teams qualifying to the Maneuver round in the Zonals will be reimbursed a limited amount for the costs incurred towards the expenses for procuring materials for their models. The competition criteria for the Finals will be declared soon. Along with the competition, Boeing will also be sponsoring aero-modeling workshops to be conducted by the respective IITs. This will act as an additional platform where students who are interested in designing and building RC gliders, can get hands on experience in designing and building them. The dates for the workshops will be announced separately. Maximum of 4 members in a team. Members of a team may be from same college/school or different (K-12/UG/PG). Professionals are not allowed. Only students can participate. Participants are required to get a bona fide certificate signed by the respective HoD/Dean/Principal in addition to their school/college ID Card. T/W < 0.75 (if excess thrust is found, it will be neutralized by adding weight below the plane at center of gravity). Propeller diameter should not be greater than 10 inches. Battery weight should not be more than 120 gm. Only electrical motors are allowed. The use of IC engines or any other means of providing thrust is prohibited. Use of gyroscopes (gyros) and programming assistance in receivers is prohibited. One of the team members should fly the aircraft and another should call the stunts as they are performed (just before). All the participants need to submit an abstract on their aircraft, which should be no longer than 15 pages (A4 size 1.5 line spacing) with standard formatting. The Abstract must document the basic design of the aircraft (dimensions, wing areas, velocity, etc.) and should also explain how their design is suitable for given problem. Along with the abstract, Participants also have to send a zip file containing at-least 5 and no more than 10 photographs of the aircraft while it is being built. The Abstract has to be submitted as per the standard format(you can download the standard format from the respective IIT websites). The Abstract has to be submitted to the respective Zonal competition 20 days in advance of the Zonal event date. E.g. For a Zonal happening on the 4th of January, the Abstract deadline is the 15th of December and so on. The competition requires the participants to design and fabricate a RC Plane (no Readymade Planes are allowed) and perform a set of maneuvers. Propellers, Motors, ESC, Servos, Receiver and Transmitter are allowed as off-the-shelf items. The zonal events will be conducted in 4 IITs (East Zone: IIT Kharagpur, West Zone – IIT Bombay, North Zone – IIT Kanpur and South Zone – IIT Madras). Participants can register at any of the four zonal competitions and bring their aircraft and all necessary equipment to participate. The arena will be an open ground. There will be two rounds in the competition. The best measure of the design of an aircraft can be done by climb and gliding time. In this round, participants are required to make their aircraft to climb for 20 seconds. After this, they need to perform a dead stick flight (throttle=0 or Gliding) and land at a specified location. The plane however can be maneuvered while it is gliding. The teams will be graded based on the glide time of the aircraft. A maximum of upto 30 teams, based on the glide time, will qualify to Maneuver Round from the Qualifier Round. Along with qualification to next round, qualifying teams will get a reimbursement of INR 5000 per team towards material costs for their models. The qualifier round is essentially to select a maximum of up to 30 teams based on their performance, who will participate in the Maneuver Round. The final winners will be based on the scores in the Maneuver round. 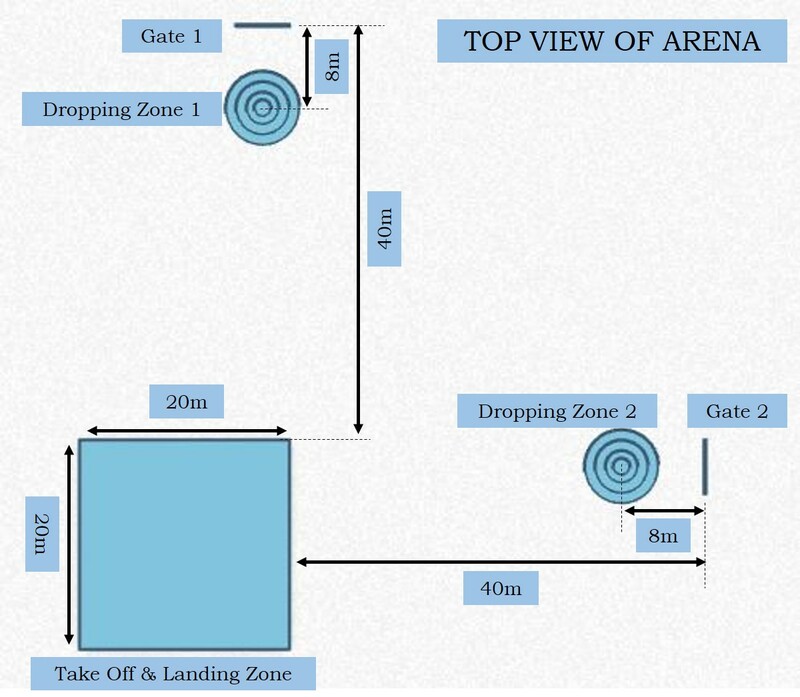 The Arena consists of 2 gates - "Gate 1" and "Gate 2" and 4 concentric circles after each gate that form a target for Object Dropping. Both the gates have a horizontal bar at 5 meters height from the ground. Each gate would have enough space for planes to pass through, yet only the skills of the pilot can guarantee a swift maneuver. Both the gates will be at 40 meters from the Take Off / Landing Zone and are symmetrically positioned from the Take Off/Landing Zone. 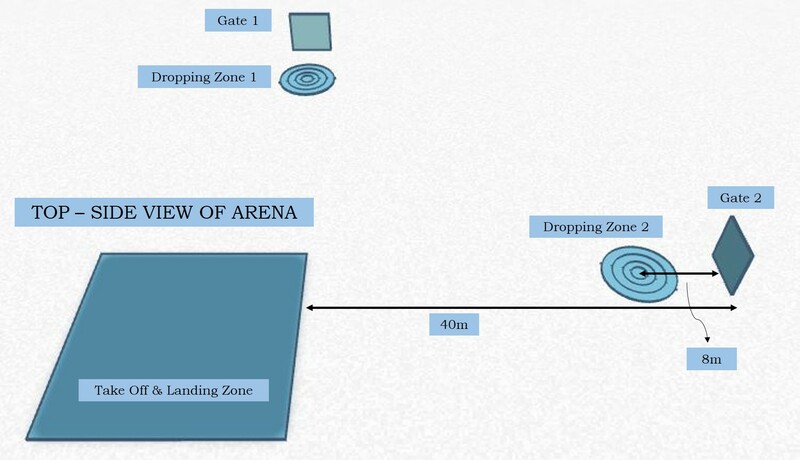 (For a better understanding of the arena, refer to the illustrations on the right). Points for Object Dropping will be awarded according to the following table. A maximum time of 4 minutes will be given between the first take off and the final landing. Any further instructions would be given before the competition, on the spot. The team should keep attempting the maneuver until they complete all steps in that order in one attempt without landing. After completing all steps mentioned in the maneuver, teams are eligible to score additional points as mentioned below. The steps have to be performed only in the given order. No points will be awarded for steps done in incorrect order. For example, if a plane does steps 1&3 without doing 2, points for step 1 will only be awarded. It is mandatory for the team to land before attempting the maneuver again. 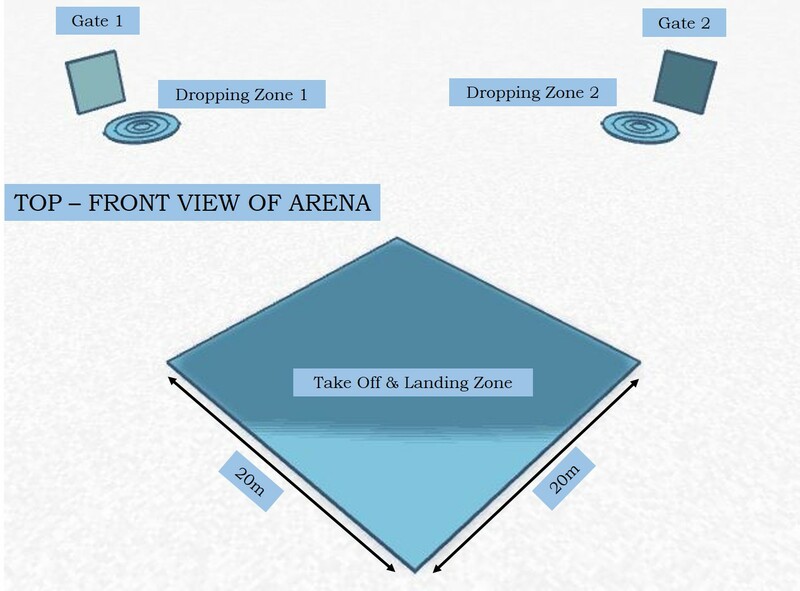 Landing can happen outside landing zone but will not be awarded any points. If there is a tie, winner will be decided by a separate round framed by the Judges on the spot. Judges' decisions would be considered final in all cases. The Pilot will try to drop the dead weight in innermost circle of 4 concentric circles drawn on the ground. Each team would be given 2 chances for each of the rounds and the best score is considered as per the scoring procedure mentioned above for each round. The timer will start from the moment the aircraft is in the air for both the rounds. Awards will be announced based on the performance of the teams in the Maneuver Round. Any revisions to the Scope of the Competition would be intimated to all the participants via registered email and on the websites of the respective festivals at-least 45 days before the event takes place. 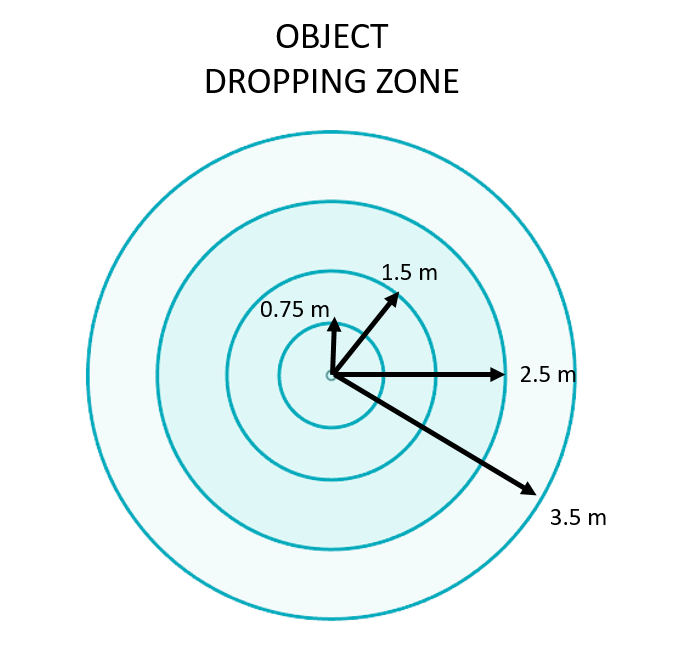 The use of 2.4 GHz radio is required for all aircraft competing in the competition. If the participants want to use any other frequency, they will have to inform the organizers in advance. A limited number of 2.4 GHz radios will be available with the organizers for use by the teams. Teams who do not have access to radios can inform the organizers in advance to request use of these radios. Receivers installed in the aircraft have to be in 'receiver mode only'. All the systems (Servos, motor, etc.) will be checked by organizers for functionality before the competition. If found not working, teams will be dismissed from the competition. Pilot can position himself at any point in the arena to fly the aircraft during the rounds. Metal propellers are not allowed. The models can have powered take-off with a landing gear or can be launched manually by a person standing at ground level. Plane should be built from scratch and not purchased models. A team member can’t be a part of more than one team. Teams can participate in more than one zonal event if they are not qualified for the finals already. Teams that claimed reimbursement in one zonal event cannot claim in any other zonal event in case they are participating in more than one zonal event. New members cannot be added to the teams who have been selected at Zonals to reach the Final Round. Bring your college/student I-Card at the time of competition. Any of the above mentioned rules, if found violated, teams would not be allowed to participate in the competition. Please feel free to contact us incase of any queries.